Counter IED Systems are programmable and customizable. With EJAB Electronic Jammer Against Bombs Counter IED products, ground troops and bomb disposal units are protected against threat of remotely activated improvised explosive devices. Man-Packed version features multi-band jammer capability built into backpack with ability to block 2 separate frequencies simultaneously using single antenna. Weighing 15 kg, system features 4 hr, hot-swap capable, battery-powered operation and emergency memory erase for information security. Israel, ... Elisra, an EW, intelligence, and communications solutions leader, will present its new generation EJAB (Electronic Jammer Against Bombs) Counter IED(Improvised Explosive Devices) family at this year's Paris Eurosatory 2010 show, Elbit Systems' booth # C-670, Israel pavilion, June 14-18. The company will spotlight its man-packed EJAB option designed to protect ground troops and bomb disposal units against the ever present threat of remotely activated improvised explosive devices. This EJAB configuration will be demonstrated as part of Elbit Systems' presentation as well. 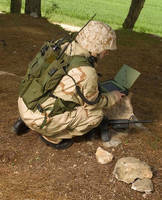 Simple to operate, easily programmable and customizable, EJAB's Man-Packed version boasts a multi-band jammer capability built into a sturdy backpack with the ability to block two separate frequencies with virtually any type of radio cellular bands simultaneously using a single lightweight antenna. This lightweight system (approx. 15Kg) utilizes a four hour "hot-swap" capable battery powered operation, as it shares all the performance parameters of the entire EJAB family including the use of sophisticated algorithms and emergency memory erase for information security. "We've developed our EJAB family of counter IED products in response to a growing threat from IEDs in a variety of environments worldwide", says Itzchak Gat, Elisra's CEO. "Elisra's 30 year experience in providing proven, pioneering solutions against increasingly sophisticated IED threats, are underscored with our new EJAB family of solutions successfully deployed with the IDF, NATO, and other military forces around the world." The other members of this battle proven electronic jamming IED protection family include a vehicle mounted version, a portable rolling case version for security forces operating in dense environments, and a vehicle mounted VIP/ civil protection light mobile communication jamming system. Elisra, a world leader for over four decades in the fields of Electronic and Information Warfare as well as Intelligence and C3 systems and has been the source of these solutions deployed in modern defense forces of over 40 countries world-wide. The company develops, designs, manufactures, integrates and supports advanced EW, Intelligence (RF and IR based technologies) and Communication solutions, for air, sea and land applications. Elisra, 70% owned by Elbit Systems Ltd., and 30% by Elta Systems Ltd. (an IAI subsidiary), comprises Elisra Electronic Systems, Tadiran Electronic Systems and Tadiran Spectralink.